Book News: Bob Dylan's Lyrics Get Their Own Book — And It's Massive : The Two-Way The 1,034-page collection sets out to annotate, illustrate and track the changes of Dylan's myriad songs. Also, after a decade on trial, Superman won't be reaching the Supreme Court. American folk pop singer-songwriter Bob Dylan, seen in April 1965. The words that so many ears know so well will soon be getting a place on the printed page — 1,034 pages, as a matter of fact. The songs of Bob Dylan have been compiled, annotated and illustrated in a collection so comprehensive, it could take some strength just to lift. 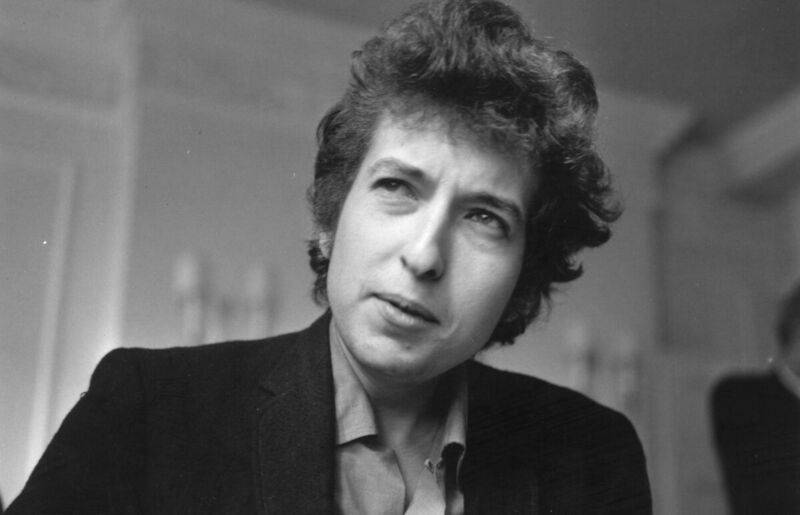 Set for publication on Oct. 28, The Lyrics: Since 1962 is the product of a collaboration between Dylan and Christopher Ricks, a British literary scholar and professor at Boston College. Ricks tells The New York Times that in his annotations, he aimed to point out the places where Dylan's songs changed over the singer's considerable career. Ricks says of Dylan's songs, "They're amazing, shape-changing things." Only 3,000 copies will be printed, and they'll sell for $200 each at bookstores. Fifty signed copies of the book will also go for $5,000 each. Sinead Takes To The Page: Not to be outdone, Sinead O'Connor has announced an upcoming book of her own — an as-yet untitled memoir slated for March 2016. And for those readers with a taste for a tell-all, never fear: There will be dirt. In a press release, the Irish singer says, "I look forward to dishing the sexual dirt on everyone I've ever slept with." Grammarians, Stand Down: Relax, everyone. If you think you need to split an infinitive or even — God forbid — leave a modifier dangling, Steven Pinker's given you the green light. The chair of the Usage Panel of the American Heritage Dictionary tells the New Republic that many grammar rules were born more from habit than necessity. "If you look at the grammar of English," he says, "you find that there is no rule that prohibits a dangling modifier. ... You find that it was pretty much pulled out of thin air by one usage guide a century ago and copied into every one since." Superman Denied: The Supreme Court has declined to review a recent challenge lodged against Warner Brothers' claims of ownership over Superman. Brought by heirs of Joseph Shuster, co-creator of the Man of Steel, the decade-long challenge contested an agreement that DC Comics — a subsidiary of Warner Bros. — and Shuster's sister made at the time of Shuster's death, which resolved "any past, present or future claims against DC." In the lower-court decision against Shuster's heirs, says The Hollywood Reporter, a federal judge ruled that "the broad and all-encompassing language of the 1992 Agreement unmistakably operates to supersede all prior grants." Against Funding Writers: In The Guardian, Allison Flood points to some choice words from Horace Engdahl, a member of the 18-person Swedish Academy that will decide the winner of the Nobel Prize in Literature on Thursday. Speaking with the French newspaper La Croix, Engdahl laments the scholarships and grants that have turned the role of the writer into a profession: "Even though I understand the temptation, I think it cuts writers off from society, and creates an unhealthy link with institutions. Previously, writers would work as taxi drivers, clerks, secretaries and waiters to make a living. ... It was hard — but they fed themselves, from a literary perspective."